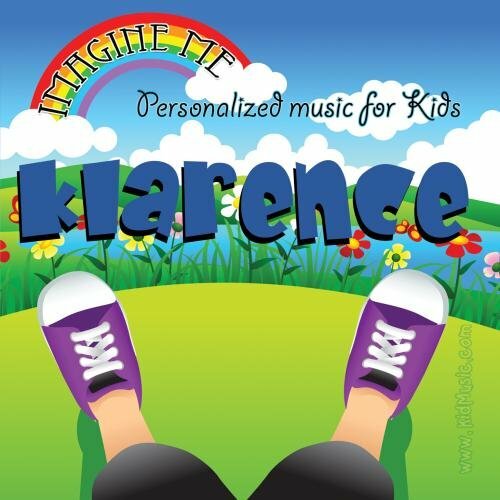 The Imagine Me CD is Personalized just for Klarence. It takes Klarence on a fun adventure filled with imagination. Why not sail above the clouds as Klarence the Airplane Pilot or Chug-A-Lug through a mountain pass as Klarence the Train Engineer. Klarence is the Teacher that helps children learn their A, B, C's. Or how about being a Dentist who helps other children keep their teeth clean. We can't leave out fun things like being a Circus Clown flying through the air under the Big Top. Remember Mary Poppins Her best friend was Klarence the Chimney Sweeper. Or Klarence will save the day as our favorite Firefighter. Has Klarence ever wanted to live on a farm Why not.... as Klarence the Farmer. There is a special puppy named Lunchbox; he and all his friends will sing Happy Birthday just for Klarence. When Christmas rolls around, Santa will send Klarence a special message. What a great time Klarence will have Imagining all kinds of wonderful adventures. Every song on this 20 minute CD is Personalized just for Klarence with the pronunciation of ( Klair-Rinse ). If this isn't the right pronunciation for your child, just look for another way of spelling the same name and you'll find the right pronunciation. Enjoy, from your friends at Personalized Kid Music.